In the race ending the 46th edition of the tricolored series the victory went to Victor Guerin (Lucidi Motors) ahead of Raffaele Marciello (Prema Powerteam) and Brandon Maisano (BVM-Target), Sergio Campana, fifth today, obtained the title and the test on the Ferrari Formula One single seater. The American Michael Lewis (Prema Powerteam) will join the Modenese next 15 November in Vallelunga as he won early the Rookies Trophy despite being forced to the retirement today when holding the lead of the race and of the Absolute classification. 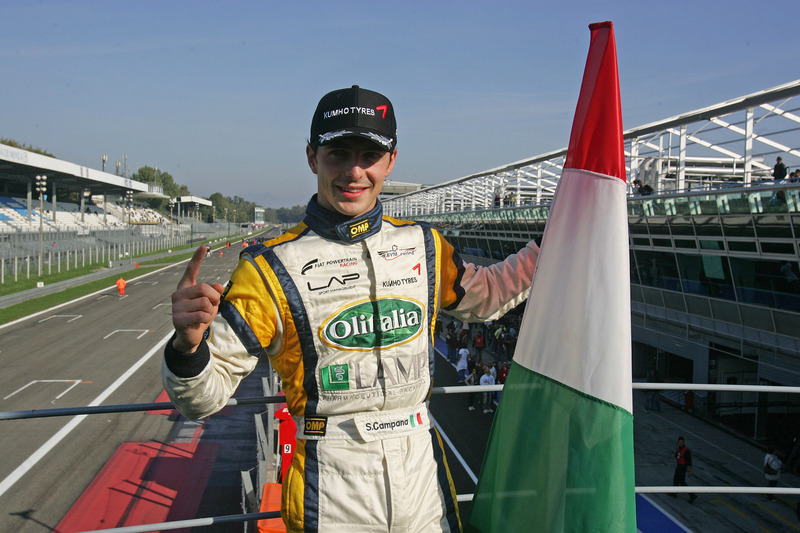 16/10/2011 - The results of the last and thrilling race of the season, full of twists and emotions, crowned Sergio Campana as the new Italian Formula 3 2011 Champion. The Modenese driving for BVM-Target added his name to the hall of fame of the prestigious Italian series thanks to the points obtained with the fifth place in a race won by the Brazilian Victor Guerin (Lucidi Motors) ahead of Raffaele Marciello (Prema Powerteam) and Brandon Maisano (BVM-Target). The last podium of the season was an all-rookies one. Michael Lewis (Prema Powerteam) was one of the big protagonists of the race and, after winning the National Rookies Title yesterday one race early, has been author of a stunning recovery taking him from the last position all the way up to the temporary leadership of the Absolute classification. The off track excursion occurred to him when just four laps were left forced him to the retirement and to give the 46th Italian Title back to Campana’s hands. The two big protagonists of season 2011 will find each other again on track next 15 November in Vallelunga to run an entire testing day at the wheel of the Formula One Ferrari, that is the extraordinary prize that Scuderia Ferrari and ACI-CSAI have been awarding since 2008 to the best drivers of the tricolored series powered by Fiat Powertrain Racing. The last race of the season saw Edoardo Liberati (Team Ghinzani) getting the fourth place that was also worth the final fifth place of the classification, behind Campana, Lewis, Marciello and Maisano. On the podium of the National Rookies Trophy, at the side of Lewis were Marciello and Maxime Jousse (BVM-Target), with the latter ending in seventh today. In occasion of the award test the new edition of the Italian Formula 3 Championship will be presented with all its novelties and more International than ever, not only for the foreign drivers that enriched the entry lists of the most recent seasons of the championship.